The National Terrorism Advisory System (NTAS) is a terrorism threat advisory scale used by the United States Department of Homeland Security since April 26, 2011. The system was announced on January 27, 2011 by Secretary of Homeland Security Janet Napolitano during a speech at George Washington University. Her official announcement followed reports of the NTAS that had surfaced the day before. The NTAS is the replacement for the often-criticized, color-coded Homeland Security Advisory System introduced by the George W. Bush administration in 2002. Napolitano said the color-coded system often presented "little practical information" to the public, and that the NTAS will provide alerts "specific to the threat" with "a specified end date." On December 7, 2015, a day after an Address to the Nation by the President from the Oval Office, a plan to add a new "intermediate" threat level to the NTAS was announced by DHS Secretary Jeh Johnson to reflect a "new phase" in the global terrorist threat against the homeland following the November 2015 Paris attacks and the 2015 San Bernardino attack. When introducing the National Terrorism Advisory System, Napolitano said, "Today I announce the end of the old system of color-coded alerts. In its place, we will implement a new system that's built on a clear and simple premise: When a threat develops that could impact you—the public—we will tell you. We will provide whatever information we can so you know how to protect yourselves, your families, and your communities." Her speech at George Washington University was timed to complement US President Barack Obama's 2011 State of the Union Address, which occurred two days earlier. On December 16, 2015, Secretary Johnson activated the bulletin capability for the first time. The alert capability has not been activated as of June 25, 2016. The color-coded Homeland Security Advisory System is the predecessor to the NTAS. The Homeland Security Advisory System was created in response to the 9/11 attacks by the administration of US President George W. Bush. After the announcement of the NTAS, Peter King, a Republican US Congressman from New York, said the color-based assessments were useful at the time of their creation, but a more specific system was now needed. The five-level color system has been criticized as being vague and ineffective, and alert levels have rarely changed from the yellow ("elevated") and orange ("high") levels. Representative Bennie Thompson, a Democrat from Mississippi, said the color codes were often better at causing "Americans to be scared" rather than telling citizens "the reason, how to proceed, or for how long to be on alert." The color-coded system has also been targeted by television comedians and shows such as Saturday Night Live, where it has been ridiculed. In July 2009, Napolitano created a task force to reassess this scale; it concluded that the Homeland Security Advisory System was unclear and lacked public support—enough so that the task force recommended discontinuing the scale. In November 2010, the Department of Homeland Security submitted a draft plan to overhaul the color system and create what one official called "a system that communicates precise, actionable information based on the latest intelligence." Under the National Terrorism Advisory System, alerts will be issued under the categories of "elevated," "intermediate" or "imminent." According to Napolitano, "When [the Department of Homeland Security has] information about a specific, credible threat, [it] will issue a formal alert providing as much information as [it] can." When an alert is provided to the public it includes the following information if it is available: geographic region, mode of transportation, critical infrastructure potentially affected by the threat; protective actions authorities are taking, and steps individuals or communities should be taking to protect themselves and families. This includes providing government agencies and emergency officials with threat assessments, as well as using news outlets and social networking resources to notify the public. It will also outline steps to take in response to a particular terrorist threat. Individual threat alerts are issued for a specific amount of time. At the end of this time, the threat alert automatically expires. If new information becomes available the threat alert may be extended. Information on whether the threat has been extended or is expiring will be distributed to the public the same way the original notification was made. In 2011, DHS added Bulletins to NTAS to distribute information about trends and non-specific threats. ^ a b c d Mathes, Michael (January 27, 2011). "New US terror alert system replaces color code". Google News. Agence France-Presse. Retrieved January 27, 2011. ^ "Orange alert ends with new US alert system". Google News. Agence France-Presse. April 20, 2011. Retrieved April 20, 2011. ^ a b c d CNN Wire Staff (January 27, 2011). "U.S. replaces color-coded terror alerts". CNN News. Cable News Network. Retrieved January 27, 2011. ^ a b "Homeland Security Plans New Level To Terror Advisory System". The Washington Post. The Washington Post Company. December 7, 2015. Retrieved December 7, 2015. ^ a b Ryan, Jason; Thomas, Pierre (January 27, 2011). "Color Coded Terror Alerts Retired by Department of Homeland Security". ABC News. ABC News Internet Ventures. Retrieved January 27, 2011. ^ Miller, Greg (January 27, 2011). 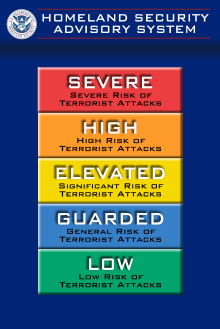 "Obama administration to replace color-coded terror alerts with new warning system". The Washington Post. The Washington Post Company. Retrieved January 27, 2011. ^ "National Terrorism Advisory System Bulletin - December 16, 2015". DHS. 2015-12-16. Retrieved 2016-01-27. ^ a b c "Color-coded terror warnings to be gone by April 27". Google News. Associated Press. January 26, 2010. Retrieved January 27, 2011. ^ Alberts, Sheldon (January 27, 2011). "Colourful U.S. terror-warning system will fade away". The Vancouver Sun. Postmedia Network Inc. Retrieved January 27, 2011. ^ a b Bliss, Jeff (January 27, 2011). "U.S. Will Scrap Color-Coded Terror Alerts, Napolitano Says". Bloomberg. Bloomberg L.P. Retrieved January 27, 2011. ^ "National Terrorism Advisory System | Homeland Security". Retrieved 2014-09-18. ^ "NTAS Public Guide | Homeland Security". Retrieved 2014-09-18. ^ "NTAS FAQ | Homeland Security". Retrieved 2016-01-27. "Secretary Napolitano Announces New National Terrorism Advisory System to More Effectively Communicate Information about Terrorist Threats to the American Public". U.S. Department of Homeland Security. January 27, 2011.